If you have room to park your RV or motorhome, you have space for one of our steel RV covers. The compact and efficient designs make the most of limited space, keeping your recreational equipment covered and protected from the damaging effects of weather all year round. 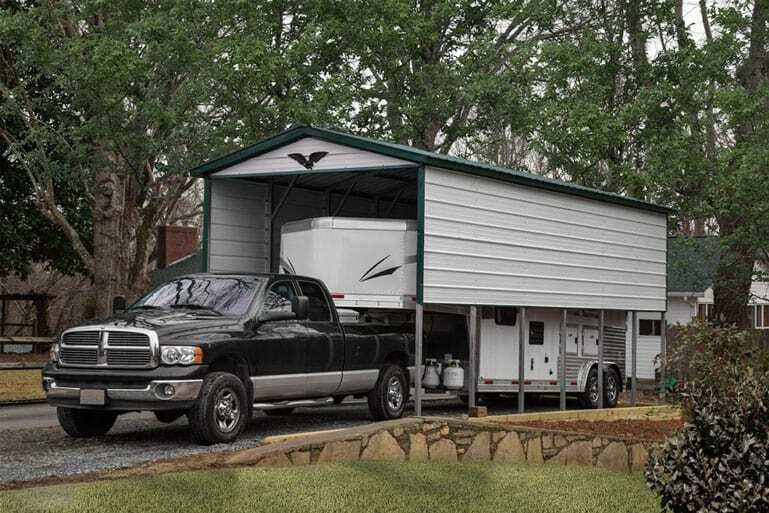 Choose an enclosed model from our selection of steel RV covers and install your own climate control system to save thousands of dollars per year on professional storage fees. From the smallest pop-up campers to the biggest Class A motorhomes, we have motorhome covers that will fit over all of them. Much like buying a boat, purchasing your own RV means committing to quite a bit of maintenance multiple times per year. The plumbing and drainage systems must be winterized each year unless you’re storing the vehicle in an area that never freezes. The roof should be inspected yearly and may need re-coating every single year by the time the motorhome is a few years old. Much of this maintenance can be simplified or even avoided entirely by parking your motorhome inside one of these metal RV covers. Blocking rain fall, sun exposure, and even controlling the climate around the RV can prevent serious damage. Even pests are easier to control and prevent within motorhome covers. Consider your climate when choosing between open carport style steel RV covers and enclosed buildings. Colder climates call for the walls because you’ll likely want to heat the space on the coldest days to prevent freezing damage to the engine and plumbing system. Consider vertically orientated motorhome covers with full-sized garage doors on both ends so you can pull straight through without any need to back up. Instead of getting metal RV covers that are just the right fit for your motorhome, consider larger spaces with extra room for storing other important pieces of outdoor equipment or maintenance tools. All of the motorhome covers and metal boat covers we sell fit into one of three categories based on its roof style. Start shopping for the perfect cover for your RV by choosing between the three following roof styles. Regular Roof: For the most affordable motorhome covers, stick with the regular roof style. It’s based on the horizontal use of metal paneling, which makes the most efficient use of the material, and the curved sides reduce waste as well. Boxed Eave Roof: Increase the stylishness and durability of your motorhome covers by upgrading to the boxed eave, or A-frame, roof style. Vertical Roof: The strongest and best looking motorhome covers are built with the vertical roof style, which is identical to how you install metal roofing on a home. Here at MetalCarports.com, we supply both the smallest and biggest steel RV covers you can imagine. With free installation and delivery, a 20 year warranty, and a 90 day workmanship guarantee, you’ll feel secure in your decision to buy a motorhome cover from us during every step of the way.